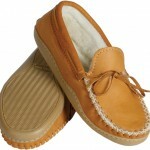 A moosehide moccasin, medium brown colour with crepe rubber sole and hand stitched upper. Suitable for casual outdoor use. 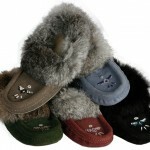 Men's Size: 8-13 $88.50 Ladies' Size: 5-10 $81.99 Color: Moose Hide Cork with crepe Rubber sole.